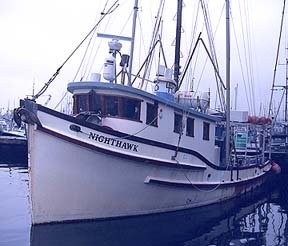 While a number of fishing techniques are employed by commercial fishermen, they can all be placed in one of four major categories; net, dredge, trap/pot and hook fisheries. In the net fisheries the quarry is captured either by a mobile or a stationary net. Dredge fisheries use a metal device towed behind a boat to capture shellfish on the bottom, trap/pot fisheries use bait or shelter to lure the quarry - fish, crustaceans or snails - into a metal or wooden trap, and hook fisheries employ fish hooks - either singly in commercial rod and reel or handline fisheries - or in numbers via longlines. There are many variations in fishing gear and techniques. The local water, bottom and weather conditions, the market demands, even the heritage of the fishermen involved all influence what gear is used, how it is modified, and hopw it is fished. But an trawl net is still recognizable as a trawl net, whether it measures 50 feet across and is used in the bait shrimp fishery or several hundreds of feet across and is used in the Alaskan offshore fisheries.